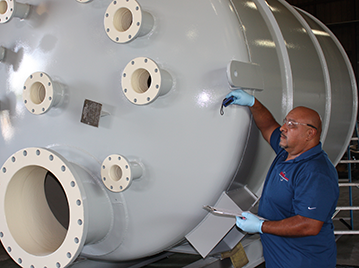 Curran International provides expert applications to pressure vessels, flanged pipe, and drums using a wide range of engineered protective coating. 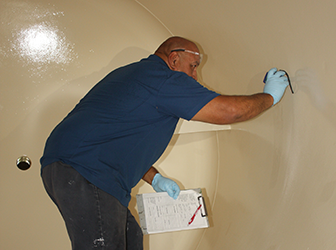 Curran 1200 – An advanced two part (100% solids) epoxy coating designed specifically for high temperature immersion service in water and process streams (365 F, 185 C). Ideally suited for vessels, tanks, waterboxes; temperature resistance 365 °F (185 °C) qualified immersion services. Curran 1500 – Advanced two part (100% solids) epoxy coating designed specifically for high temperature immersion service in water, hydrocarbons, and process streams (up to 365 F, 185 C). 1500 offers excellent cold wall resistance; pressurized Atlas Cell Test 60 days DI water at 365 F (185 C). Ideally suited for exchanger components; small pressure vessels; tanks, water boxes. 1500 offers excellent cold wall resistance – Atlas cell test: 6+ months DI water at 210 F (98 C); pressurized Atlas Cell Test 60 days DI water at 365 F (185 C). Ideally suited for exchanger components; small pressure vessels; tanks, water boxes. Temperature resistance 365 °F (185 °C) qualified immersion services. Baked Phenolic – Dense, tightly adhered thin-film resins, having wide chemical resistance for chemical storage and transport applications. Used for ISO containers, chemical transport, pressure vessels. PTFE nonstick coatings – Low coefficient of friction, high-temperature resistance, and superior chemical resistance are the key benefits of these coatings. PTFE, PFA, FEP and ETFE fluoropolymer resins are marginally differentiated in mechanical performance but offer immersion resistance up to 500F. FBE coatings – Thermosetting epoxy coating designed for corrosion protection; applied as a dry powder which melts and cures to a uniform, coating thickness. Suitable for operation at moderate temperatures and pressures in the presence of H2O, CO2 and CH4, crude oil and brine. Fluoroelastomer Viton – Low permeability, elastomeric two component coatings, superior chemical resistance, UV resistant; suitable for wide range of vessel substrates. Also available in sprayable solvent and water based formulations. Thermally sprayed alloys – Thermal spray atomizes alloy wire which is sprayed onto a substrate, improving galvanic protection and inhibiting corrosion. Gas acetylene and arc spray application methods are used to apply Nickel, Stainless, and surface hardening materials. Curran has field application experience. Force curing and coating bakes can be precisely controlled to 700F using thermocouples to monitor and record steel and air temperature. Our gas fired convection oven can accommodate pipe lengths to 45 feet long and overhead crane and forklift capacity for nearly any transportable vessel. Contact Curran International to review your coating specification, one of the following materials may meet your requirements.